"University of Illinois, Fighting Illini, I hear you loud and clear, and I'm ready to answer some questions," Mike Hopkins said to loud applause from Urbana. Training on simulators is one thing. Orbiting the earth on a 925,000-pound space laboratory the size of a football field is something else altogether. Two and a half years of training did not fully prepare astronaut Mike Hopkins for the thrill of his life aboard the International Space Station. 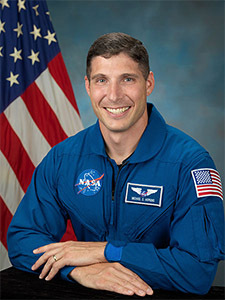 "The station is even more amazing than I ever thought it was going to be," Hopkins said Tuesday from space, addressing a spellbound audience at the University of Illinois National Center for Supercomputing Applications via live NASA hookup.